You choose your album size and cover style in our album shop. You upload your photos while ordering. You pick the cover style and cover material. We start designing your album and send you the album design proof. You review the design proof and request changes as many times as you want until you’re happy with the result. You confirm the design proof. We start making the album and send you a photo after the album is finished. We ship the album and you can track it in your account. Yes, you can upload your own design while ordering from our shop. Standard It takes us between 1-2 working days to design your album. Express It takes us 24 hours to design your album. What's the maximum number of pages for an album? The maximum amount of pages we currently offer is 70 pages (35 spreads). What's the minimum number of pages for an album? The minimum amount of pages we currently offer is 30 pages (15 spreads). Do you also do boudoir albums? 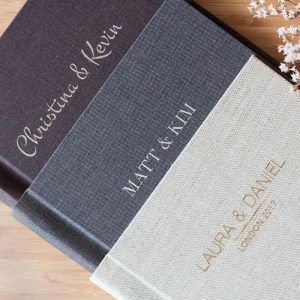 Yes, you can customize and order from our range of albums for weddings, boudoir, bar mitzvah, bat mitzvah, guestbooks, family albums, parents albums or children albums. What kind of materials can I choose for my album's cover? You can check our available materials here. 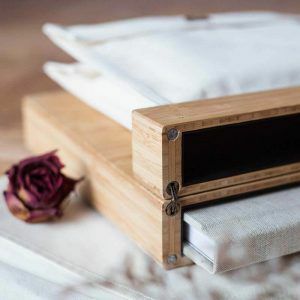 You can choose between ecological leather, linen and genuine leather. Where can I see some of the albums you have made? You can see our albums gallery here. You can filter the gallery by the cover material, style or size. What cover styles do you have? We currently offer a variety of cover styles. You can also see our albums gallery here and filter them by the cover material, style or size. How much does the album design cost? We offer FREE design services for each album. We offer FREE standard shipping services. If you need it sooner you can choose express delivery for an additional $25. Each album price varies based on size and number of pages. You can use our pricing calculator to find out how much an album is going to cost you. If you need more help you can contact us. How much do parents albums cost? Parents album are actually duplicates of the same size or smaller albums. Their price has a discount of 30%. If you buy 1 Large album and 1 Small Album you will have a 30% discount for the Small Album. What's the maximum amount of duplicates? There is no maximum amount that you can order for duplicates. You can have as many as you want and each will have 30% discount. Can I ship the album to a different address? Yes, you can fill out the shipping address when you order your album. Billing and shipping address can be different. We currently ship to almost every country in Europe, North America, South America, Asia and Australia. Standard It takes us between 3-5 working days to finish your order. Express It takes us 24 hours to finish your order. What kind of personalization do you offer? No, at this time we don’t offer gift wrapping.